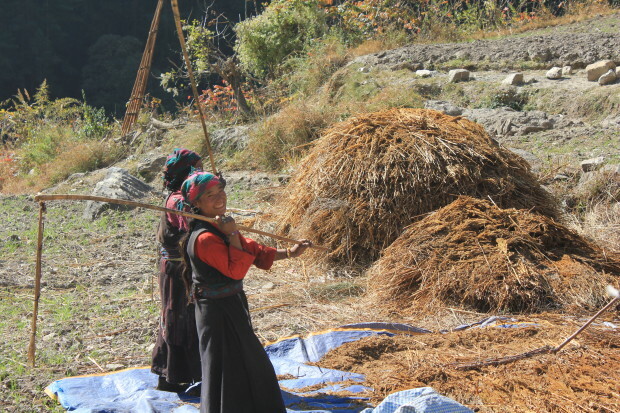 Tsumpas harvesting grain, November 2012. Photo courtesy of Jane Marshall. Mu Monastery and Rachen Nunnery are located in the Himalayan valley of Tsum in Nepal. They were established in the early 1900s by the first Drukpa Rinpoche, a beloved Bhutanese lama who meditated in the Himalayan borderlands. It’s a naturally inspiring place because of its mountain vistas and pure environment, and it’s said to be beyul, a secret valley protected by Guru Rinpoche. The second and current Drukpa Rinpoche cared for Mu and Rachen for many years. He’s described by many Tsumpas as humble and kind. As his age advanced and his health declined, he was unable to stay in Tsum, so he asked Lama Zopa Rinpoche for help. In 2003, Lama Zopa Rinpoche requested that Geshe Tenzin Zopa (featured in the documentary Unmistaken Child) direct the Tsum Project in an effort to revitalize Mu and Rachen. Geshe Tenzin Zopa held this position until 2011. Now Tenzin Lundup manages both Mu and Rachen with the support of Kopan Monastery and FPMT. I’m Jane Marshall and I’m a travel writer. I visited Tsum, including Mu and Rachen, in 2012 during research for my book Back Over the Mountains. It’s a place etched permanently in my memory. The article below first appeared in the Edmonton Journal, and I’m pleased to now share it with Mandala readers. Tsum Valley faces imminent changes, including slated road construction from China as well as the stresses and benefits of trekking tourism. I hope these articles shine some light on the hard work many Tsumpas are doing to share and preserve their quickly changing culture, and that my own experience may make a small contribution to these ends. View of the Himalayas from Drephuet Dronme Nunnery. Photo courtesy of Jane Marshall. If I could’ve peeked into the future and seen the five-year path I was about to embark on when I began writing my book, Back Over the Mountains: A Woman’s Pilgrimage to the Buddha Within, I might have run screaming. But such is the way of pilgrimage – it’s never easy. Perhaps that’s what makes it so meaningful. 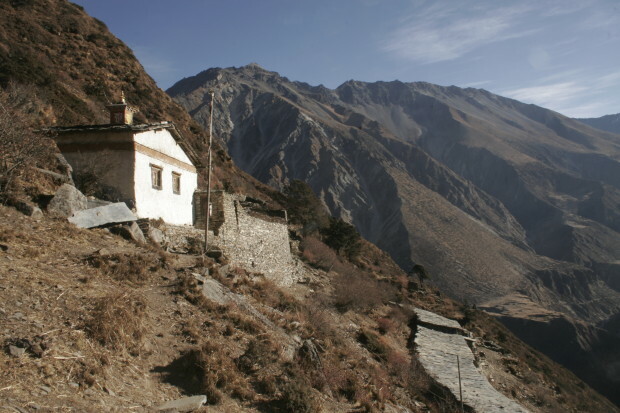 My five-year journey led me to my ultimate pilgrimage destination: Tsum Valley, Nepal. It all started when I met Edmonton’s only Tibetan Buddhist monk, Kushok Lobsang Dhamchöe, in 2008. He shared stories of secret valleys and his escape from Tibet as a nine-year-old boy, and of his uncle, a great Buddhist master of the Himalayan borderlands. This journey launched my first book project, for how can a travel writer resist a tale such as this? I also journeyed through Tibetan Buddhist philosophy studies. And without all that, I never would have found my way to Tsum. The Himalayas drew me to them twice – first in 2009 with Kushok as I tried to take him to his homeland. This formed Part II of my book: Following the Master. The second time, in winter 2012, I launched myself across the globe for a one-month solo trip seven days’ walk into the Himalayas to test out all I had learned. This became Part III: Finding the Buddha Within. Lopsang (left) and teahouse owner during our trek into Tsum, November 2012. Photo courtesy of Jane Marshall. After the last navigable road, the path begins; it rises and falls along the steep sides of the Budhi Gandaki ravine before breaking east toward the Tibet border. Elevations range from around 500-4,500 meters [1,600-14,800 feet] and the religion transforms from Hinduism to Buddhism. Tsum Valley only opened to travel in 2008 (though a handful of intrepid researchers and travelers were given restricted access prior). Once part of Tibet, it was swallowed into Nepal and thus escaped the devastation of Chinese occupation. Ancient Buddhist traditions were preserved and, within this protection, I searched for links to Kushok’s past. His birth village is only a day’s hike from Tsum. Rhesus monkeys danced in the trees; I pressed my body into a cliff wall as another mule train descended. 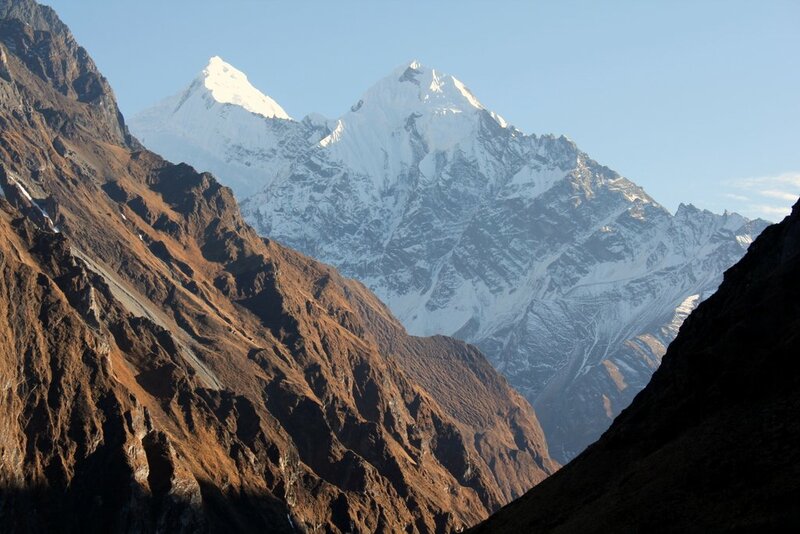 The spires and peaks of Shringi and Ganesh Himal danced like goddesses on the blue sky. At the top of yet another ridge, after slogging amongst marijuana bushes and stinging nettles, through puddles of donkey urine and over unstable rock, I’d think, ‘Yes! I’ve made it! That wasn’t so hard.’ Then I’d see four more rises and my ego would crack. My bones groaned, my emotions balked, and my mind would form a mini hell for awhile. These discomforts forced me to look at my own mind and realize its power. What I realized: we let our minds form our realities – whether heavenly or hellish. I wanted to be launched straight into Shangri-la, into the valleys I’d dreamed about through Kushok’s stories. But that seemed to be an unsustainable high judging by the fierce terrain. Each experience became a microcosm of heaven or hell – from low to high, or hot to cold as I slogged from subtropical heat to icy alpine environs. So instead, my goal became finding peace in each unpredictable circumstance. I also realized I was even starting at the “end of the road,” a point at which I’d have to find my path without my teacher. For Kushok was back in the comforts of Edmonton. This is why pilgrimage is done in places like India and Nepal, where there’s so much chaos we’re knocked off kilter, or so much silence we can’t avoid facing ourselves. Consider the Himalayas; they form earth’s largest scar, her most unruly, violent, shaky ground that was ploughed skyward by the Indian subcontinent 70 million years ago. That heaving land, now risen to stony vastness, became my temple. I began seeing heaven in the most unlikely places; in the eyes of a Hindu mother picking nits from her child’s hair, or in the bone-dry autumn earth, decorated with the skeletons of leafless pepper trees. I saw it in the sky, and below, in the valley. When I let go of trying to find heaven, there it was. In everything. Drephuet Dronme Nunnery, December 2012. Photo by Lopsang Chhiring Lama. My guide Lopsang led me to a remote nunnery at 4,000 meters [13,000 feet] near the border. We arrived at twilight after a full day’s hike; I was far from home and exhausted. We entered the nunnery, which clung to a mountain like a lone pearl, and listened to the ephemeral chanting of a nun. After her ritual drum and bell fell silent, I looked about the temple. Golden buddhas gazed from the altar and were flanked by two thrones. I’d been sitting next to one during the chanting, and whose picture was set upon it in honor, but Kushok’s uncle – the past master of Drakar Taso Monastery in Tibet. Shocked, I bowed down to all the uncertainty of the journey, to the long path that had brought me there. I pressed my forehead to the cold plank floor in reverence and wonder. I’d found a lost link to Kushok’s past and in doing so, had found my own way into the holy Himalayas. This taught me a great lesson. When on pilgrimage, you must follow your intuition. You must listen to your inner teacher. 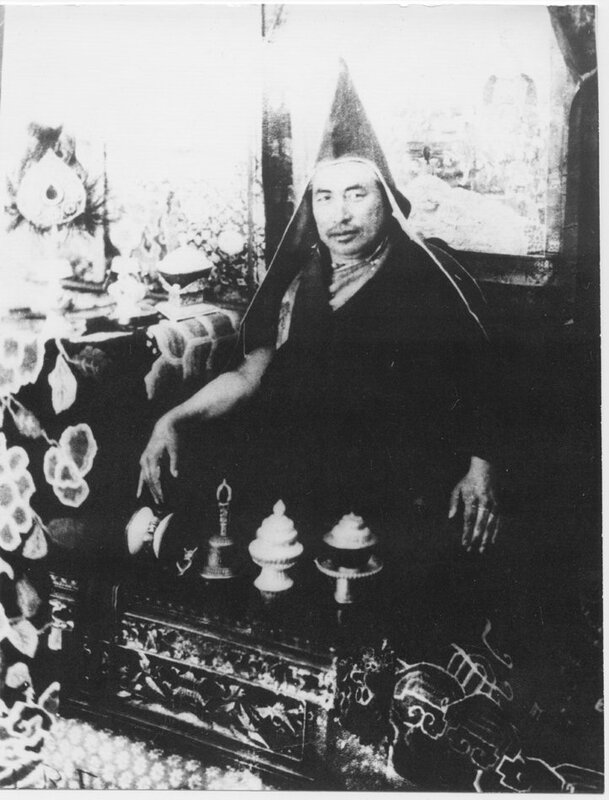 The 16th Drakar Rinpoche of Drakar Taso Monastery (Kushok’s paternal uncle). Photo courtesy of Wisdom Publications. I had a busy trekking schedule ahead, but the moment I saw the picture of Kushok’s uncle, I let go. I stopped trying to get somewhere, to check things off the list, and decided to stay. How could I leave a nunnery that held stories of this broken lineage? Lopsang returned to his family in the valley. I’d arrived at the heart of the story, and in doing so became the first Western woman to stay at Drephuet Dronme Nunnery to meditate. Rather than making my pilgrimage about visiting many different monasteries and nunneries, Drephuet Dronme set me on a pilgrimage within. Above the nunnery was a cave where Kushok’s late uncle had meditated decades prior. I was astounded. I’d found a sacred place of silence and contemplation – one I’d never even imagined existed. For a mountain girl like me it was the most perfect place on earth. I meditated in the master’s cave and as I looked to the Himalayas from that vantage point, their voluptuous glaciers and tawny flanks, the yaks that grazed them, the dirt and the pure snow, I finally let my mind rest. I’d arrived at the destination of my pilgrimage and I laughed when I realized that the path to Tsum had led me right back inside myself. You can learn more about and offer support to Mu and Rachen through the Tsum Project. Jane Marshall’s book is currently being edited. Visit her website at www.seejanewrite.ca for publication updates and blog posts. 1. Deborah Willoughby, “A Time-Honoured Remedy,” ed. Linda Sparrowe, Yoga International (Himalayan Institute), no. 118 (Summer 2012): 32.